This article was written by WTOP’s news partner ARLnow.com and republished with permission. Customers walking into the new luxury shoe store “JŪS4thqtr” on Lee Highway may be surprised to be greeted by a wall of juice bottles. The real way in is through a refrigerator door, which pushes open into a showroom with illuminated shelves of footwear and display cases holding high-end fashion. Founders Shadi Ello, 24, and Mohamed Sha, 27 told ARLnow that the speakeasy entrance is all part of a feeling of “community engagement” they wanted to cultivate since opening last month. It’s also why they show only display shoes, Ello said, to encourage customers to ask store employees about sizing and color options. The store is located in an unassuming, low-slung shopping center at 5139 Lee Highway. Initially, Ello said he was worried about attracting enough customers to a high-end boutique in “deep Arlington” but so far they’ve had enough customers to start running out inventory. JŪS stocks about 4-5 glow-in-the-dark Yeezy 750 Boosts that run $1,000 and several sneakers from the Off-White Airmax 90 collection for $750. For women, there’s a selection of kicks from Adidas and Travis Scott in size 5 for $500. The most expensive shoe is the ‘Not For Resale’ Air Jordan 1s selling for $1,500. “The shoes just generate foot traffic,” said Ello, who acknowledged many of the shoes “are outrageously priced” by design. Most of the store’s revenue comes from its apparel, he said. The clothing sold at JŪS includes a $35 JŪS-branded shirt, $200 for a leather body vest from Maryland designer Daniel Green’s brand “Insane Cult”, and a $1,000 Dior sweatshirt. Ello, who grew up in Arlington and attended Wakefield High School, expected most of his customers to be in high school or their mid-20s, and was surprised by the number of middle schoolers shopping to resell kicks. He jokes that the 11-year-olds “like to give me a hard time” about the prices but he enjoys them coming by. 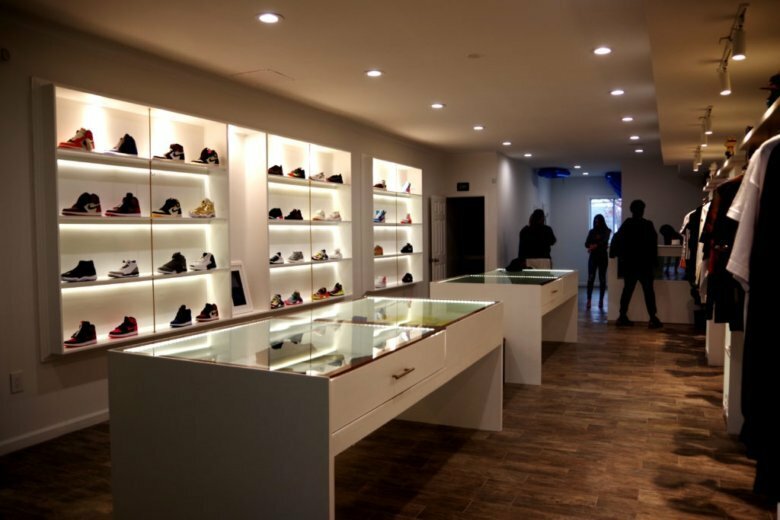 “It’s not illegal, and it’s keeping them in a safe, clean environment selling shoes,” he said. Ello, Sha, and a third co-founder say they signed a lease in the shopping center six months ago. After three weeks of steady business, they say they’re working on turning the basement into a space for photo shoots and pop-up fashion galleries. The store’s Instagram account has already filled with some of the modeling shots.